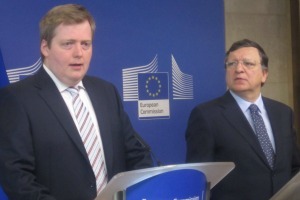 European Commission President José Manuel Barroso told the new eurosceptic prime minister of Iceland yesterday (16 July) that his country should decide “without further delay” if it wanted to continue accession negotiations, or abandon plans to join the EU. “We look forward to clarity, on the validity of Iceland’s membership application, after the parliamentary assessment on EU accession which will take place this autumn,” Barroso told Sigmundur Gunnlaugsson, who made his debut in Brussels since becoming prime minister on 23 May. Gunnlaugsson, 38, is Europe's youngest democratically elected head of government. Since 2009, he has led the Progressives, a centre-right and liberal party affiliated with the Liberal International. The Progressive Party finds most of its support from farmers and fishermen. In coalition with the Independence Party (see background), the Progressives oppose EU membership. Barroso said the Commission respected the decision of the government regarding the accession process. In May, the new government announced a halt to the country’s EU accession talks until Icelanders vote in a referendum within the next four years on whether they want membership negotiations to continue. “It is in the interest of the EU and Iceland that the decision is taken on the basis of proper reflection, and in objective, serene manner,” the Commission president stated. But Barroso insisted that the Union expected Iceland to make up its mind fast. “The clock is ticking, and it is in the shared interest of us all, that this decision is taken without further delay. We hope that this debate in Iceland will provide us with clear indications on the way ahead,” he said. Barroso told his guest that “the unanimous decision of EU member states” to open negotiations remained valid. Since the EU opened negotiations with Iceland in July 2010, Croatia joined the Union this month. "My message today is clear; provided that Iceland wants it, we remain committed to continue the accession negotiations process, which I’m certain could address Iceland’s specificities,” Barroso said, in reference to the difficult negotiation chapter on fisheries. Gunnlaugsson said he had used the opportunity to ask Barroso about “developments in the EU” and founds his answers “very informative”. After a debate in Iceland's Parliament in the autumn, he said it would be possible to assess “how things progress” with regard to his country’s EU bid. But he said a decision on when to hold the referendum had not yet been made. Asked about possible sanctions on mackerel overfishing, which EU fisheries Commissioner Maria Damanaki threatened to impose the previous day, Gunnlaugsson said he expected the EU to be consistent with WTO rules and said he hoped a “negotiated solution” could be found. Iceland recently unilaterally increased its mackerel quota, saying that the move was justified after the fish began migrating further North as a result of warming seas. Gunnlaugsson insisted that Iceland was committed to sustainable fisheries and said that in fisheries, Iceland could teach the EU some best practices. “We would like to assist the European Union in gaining similar results, regarding their fish stocks. If the EU preserves their fish stocks in the same way as we do, that would increase the value of European fisheries tremendously,” he said. Barroso retorted that the mackerel fishing was a matter of serious concern to all coastal states, and that the stock was now in danger. “We want a negotiated agreement, and therefore we cannot support unilateral action by our partners,” he said. Gunnlaugsson insisted on having the last word and said that if both sides decided to look at the scientific advice, he was certain that a solution could be found. Iceland was hit severely by the 2008 global financial crisis and economic downturn that followed. In the summer of 2009, Iceland's parliament backed the government's plan to begin accession talks with the European Union. Only one year later, the country started EU accession talks. With the approach of the elections, in January 2013 the government decided to put on hold negotiation over the “difficult” chapters relating to fisheries, agriculture, right of establishment and services, and on free movement of capital. The vote was favourable to the Independence Party, which has participated in every government between 1980 and 2009, and to the Progressive Party, its main rival and partner in previous coalitions. Both parties are against Iceland joining the EU or the euro. Before taking the post of Prime Minister, Sigmundur Gunnlaugsson, leader of the Progressives, said that that his cabinet intended to halt his country’s accession negotiations, pending a referendum on his country’s relation with the EU. EURACTIV Poland: Barroso pop?dza Islandi? …and which part of ‘referendum’ don’t you understand, Barroso? I live in Edinburgh and ‘space cadet’ and ‘chancer’ are very much still in vogue. I just think he’s a c**t.
Nobody wants to join an anti-social, semi-bankrupt, bad copy of the United States. Fortunately their are still options to get out of the EU(SSR) sinkhole which some people (roflol) call a democracy. Congratulations Iceland!